Mazda UK’s managing director; Mr. Jeremy Thomson had a lot to say in favour of this brilliant model. In spite of the growing number of model rivals in the segment, the MX-5 consistently continued to receive praise from motorists and journalists alike. To welcome in the summer, Mazda has lately inaugurated a new special version, an iconic sports car commonly known as the MX-5 Venture Edition. The new edition comes in soft-roof or Roadster Coupe form making it the world’s most popular sports car in the auto-industry for either purchase or lease. The new edition will allow car buyers to benefit from its advanced luxurious features, distinct exterior colours and other advanced specifications. Just like the Mazda MX-5 S, the Venture Edition is currently available for both purchase and lease as either a 1.8-litre MZR Soft‑top or a 2.0-litre MZR Roadster Coupe. If you’re looking to purchase or lease a new Mazda contact our sales team. 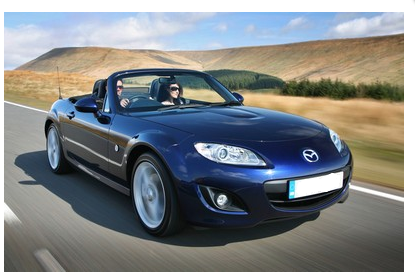 Alternatively, visit our website where you will find new and used Mazda’s available for sale or on finance.